John WINGE II (1613 -1699) was Alex’s 9th Great Grandfather; one of 1,024 in this generation of the Shaw line. John Winge was baptized on 1 Sep 1611 at Strood, Kent, England . His parents were Rev. John WINGE and Deborah BACHILER. In 1632, shortly after the death of his father, he emigrated to New England with his three brothers, his mother, her father, Stephen BACHILER and her mother Helena Mason Bachiler on the ship William & Francis. He married Elizabeth DILLINGHAM at Sandwich, Plymouth Colony, around 1645. After Elizabeth died, he married Miriam Deane on 31 Jan 1692/93 . John’s will is dated 13 Apr 1696 and he died at Harwich, Barnstable, MA, around Apr 1699. 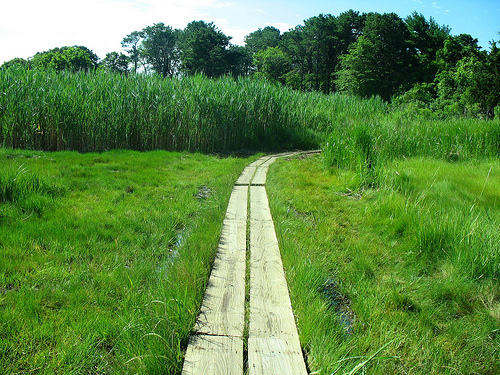 John Wynge’s Island – Returning to 6A you will pass the Cape Cod Museum of Natural History, also worth a stop, as a stunning nature trail out to Wing’s Island (Photo) will take you to one of the Saquatuckett Indians’ summer encampments, and later the property of one of Satucket’s first English settlers, another Quaker named John Wing. Elizabeth Dillingham was born at Cotesbach, Leicester, England, before 2 April 1616. Her parents were Edward DILLINGHAM and Ursula CARTER. Elizabeth died at Yarmouth, Mass, on 31 Jan 1692 and she is buried at Dillingham Cemetery at Yarmouth (now Brewster), Mass. Miriam Deane was born at Plymouth about 1634. Her parents were Stephen Deane and Elizabeth Ring. Her grandparents were our ancestors William RING and Mary DURRANT. Miriam is the oldest first time bride in our family tree. She was 59 when she married John. She is also interred at Dillingham Cemetery. Miriam’s will dated 24 May 1701 proved 8 Jan 1702/03 gives all her property to Dean Smith, “son of my Kinswoman, Bethiah Smith of Monomoy.” Bethiah was Miriam’s niece, daughter of her sister Susannah Dean and Stephen Snow. It is believed that the Winge family lived with their maternal grandfather,Rev. Stephen BACHILER while at Saugus. When Rev. Stephen moved away from Saugus, he apparently gave the property to John. This is deduced from the fact that John Wing was the grantor who sold the property to William Tilton after the family moved to Sandwich. In 1637, ten influential citizens from Saugus had petitioned the General Court of Plymouth Colony to found a new settlement on Cape Cod. Whether their decision to settle in that area was influenced by Rev. Stephen Bachiler’s attempt to found a settlement at Mattacheese (now Yarmouth) is not known. It is known that The Wings were among the “three score” [about 60] families who moved to the new settlement shortly after it was granted. Even at this early date, Massachusetts Bay Colony was fast outstripping the older Plymouth Colony, both in population and political clout. The Bay colony could well afford to lose some colonist to its neighbor, and the relationship between the two colonies were always amicable. It is unknown how it was decided to name the new settlement Sandwich, Mass. It was clearly named after the city of Sandwich in Kent County, England as it bears some physical resemblance to the old Cinque Port city. The Wings were the only family in the new town who are known to have lived in its namesake town in England. John was originally the head of the household for the whole Wing family. It is believed by many that the house they lived in was called The Orchard House. In Jun 1640 his brother Daniel purchased the homestead of Andrew Hallett and moved there. His brother Stephen was granted (or purchased) the “Fort House” on Spring Hill circa 1645. At about the same time (circa 1645) John married at the relatively advanced age of 34 to Elizabeth Dillingham, daughter of Edward Dillingham, another early settler of Sandwich. The Dillingham 2000 project [comparable to the Wing Family of America, Inc., at one time on-line, but not found at the present time] has accepted this lineage for the John’s wife. It is believed the marriage took place in Sandwich, before the family moved. The Wings and the Edward Dillingham family were near neighbors in what was called the “Upper Field” by the late Charles Dillingham. The first houses they built were doubtless like those of the rest of the new town, a frame of heavy beams resting on corner rocks, with a dirt floor later boarded over, and the space under the beams filled with sod to keep out the draft. These early rough shelters did not survive for long because the bottom rotted quickly, but they served until the farm was established and a bigger and better built house could be raised on a permanent foundation of split fieldstones. Even with these, there was no full cellar, only a deep root cellar. Around 1647 John moved further down the Cape to the town of Yarmouth. 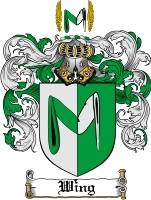 It is believed that his mother, Deborah (Bachiler) Wing, and possibly his brother, Matthew, moved with him. In 1659 he removed further east to what was originally called Sautucket. 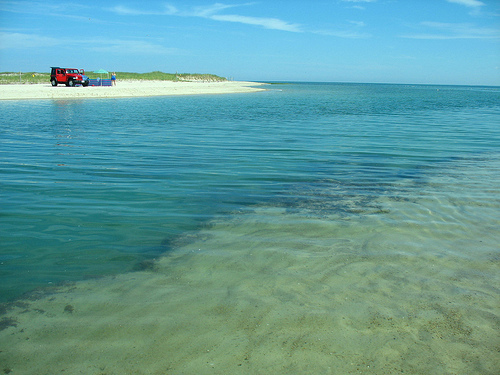 This territory was originally within the bounds of Yarmouth, but in 1694 was incorporated as the town of Harwich and in 1803 became the town of Brewster. 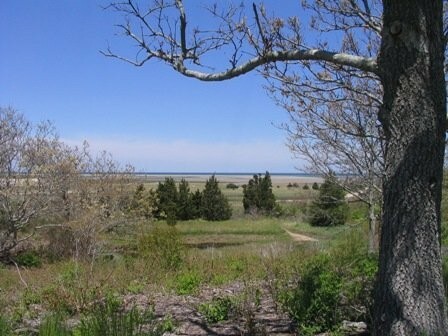 The precise spot on which John Wing settled is supposed to have been a high piece of land surrounded by swamp or meadow land, subsequently called “Wing’s Island,” about a mile northeast of the present town of Brewster. 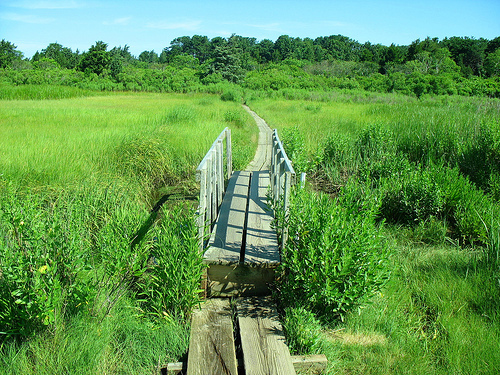 Wing’s Island is adjacent to the Cape Cod Musuem of Natural History and is administered by the museum. Google Map. 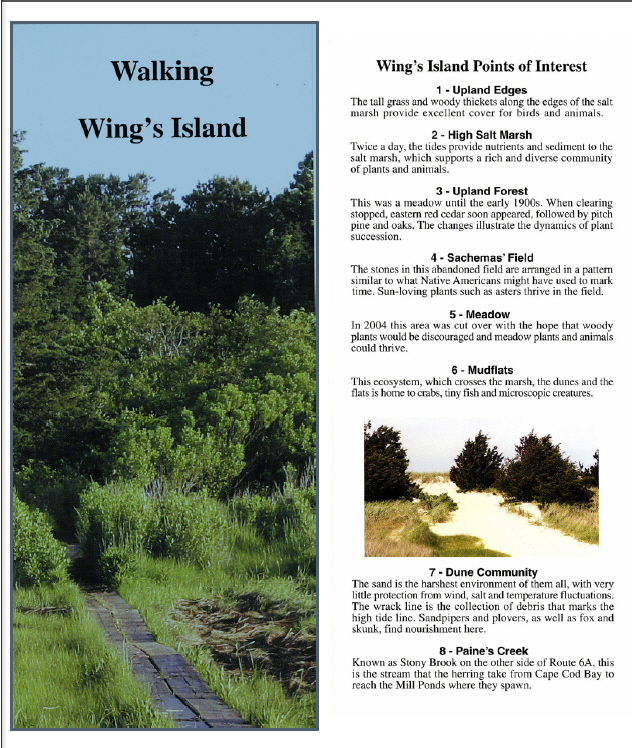 JOHN WING TRAIL (1.3 miles) is their most popular field walk that passes through the coastal pitch pine woodlands, across a salt marsh, to Wing’s Island and finally descends through a salt marsh swale to the barrier beach and tidal pools of Cape Cod Bay. This is truly a microcosm of the Cape’s landscape. A Museum naturalist guide will point out many of the interesting ecological features and explain the natural and human development which have shaped our fragile land from geological times to the present. 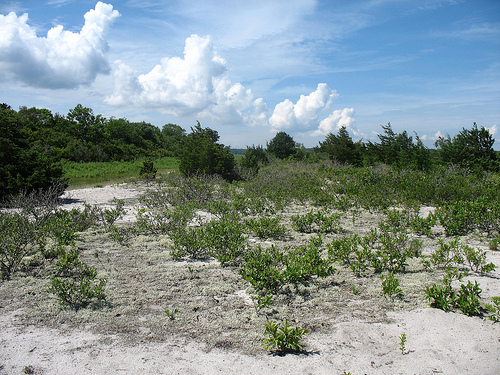 The tidal flats and creeks are home to a variety of fish, crabs, shellfish, worms, horseshoe crabs and snails as well as many seaside plants, grasses and trees. John was the first settler of this area and was originally taken to court in March 1659 as it was thought that the land was not within the limits of the grant of Yarmouth. It was proven that his land was indeed within the grant of the township, so he was allowed to continue his settlement there. John Wing Nature Trail. John harvested salt hay from this marsh and may have farmed the uplands. It is not known if John embraced the Quaker faith, like his brothers Daniel and Stephen. It is known that most of his descendants belonged to the established First Parish Church of Harwich [later Brewster.] Living several miles from the nearest church, John may not have been a regular attendant of any church. It is known that he was instrumental in assisting his brother Daniel saving his possessions during the Quaker persecution by arranging to have Daniel’s estate probated during his lifetime. John was also mentioned in the Quaker men’s meeting of Sandwich on 4 3mo [May] 1683 and on 2 11 mo [Jan] 1684/85. John’s wife, Elizabeth was the “Old Goody Wing” who died at Yarmouth on 31 Jan 1692/93. John later married Miriam Deane, born at Plymouth about 1632. John wrote his will between 13 Apr – 2 May 1696 and had added a codicil to it dated 6 Feb 1698/99. This will was proved 10 Aug 1699, so he died sometime between the last two dates. His widow’s will was dated 24 May 1701 and was probated in Jan 1702/03. John and both of his wives probably were buried in the Dillingham Cemetery at Sautucket (now Brewster). Some have inferred that he had been with his father-in-law during his sojourn in Holland, and that he had some near connection with the Rev John Wing, who was the pastor of an English congregation in Flushing, in the Province of Zealand, in Holland. He does not appear to have been, any more than his associates, possessed of peculiar means beyond what were requisite for his voyage, and when a removal from Saugus became desirable, his aim was to find a suitable home on the cheaper lands beyond the limits of the older settlements. He was probably one of the number who performed the journey with Mr. Batchelder for the settlement of the Mattacheese, and though that enterprise failed, he perhaps then became acquainted with the region afterwards known as the Peninsula of Cape Cod. The land there was perhaps no more inviting for agricultural purposes than that which then generally engrossed attention within the jurisdiction of the Massachusetts Bay Colony, but it had some advantages for fishing purposes, it was not encumbered by heavy forests, it was easy of cultivation, it might be had free by all acceptable occupants, and the Indians in possession of it were remarkable for their uniform friendship for the English. It was within the jurisdiction of the Plymouth Colony, though beyond the limits of any organized town. About ten years before (1627), a trading house had been located at a place called Manomet, at the head of Buzzard’s Bay, with the view of maintaining commerce with the southern coast and of avoiding the dangerous navigation around the Cape;but for some reason this enterprise had been abandoned, or was confined to the business of mere transportation. In 1637 Edmund FREEMAN and nine others who had been residents at Saugus, formed an assocuition “to erect a plantation or town within the precincts of his Majesty’s General Court at Plymouth,” and near the neck of land between the opposite shores of Barnstable and Buzzard’s Bays. On the third day of April, in the same year, the General Court at Plymouth gave to these persons the right to form said plantation or town, “and to receive in more inhabitants to them according to order, and duly to dispose of said lands to such as were or should be orderly admitted to them insaid township. They were soon on the ground, and with them about fifty others who were called “assodates,” chiefly from Saugus, Duxbury and Plymouth. 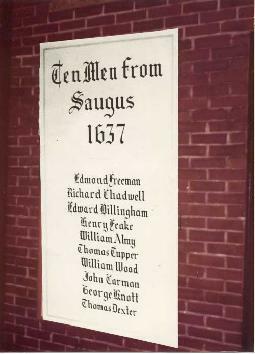 The names of Edward FREEMAN and Edward DILLINGHAM appear among the original “Ten men of Saugus,” and the name of John WINGE II occurs as the 45th in the list of their first associates. Nearly all those mentioned took families with them, and by the terms of the act granting them permission to settle none were allowed to become housekeepers or to build any cottage or dwelling to reside singly or alone, or if their characters were not acceptable to the Governor. Church membership, communion at the Lord’s Table and a regular attendance upon and a proper support of public worship at authorized plates were indispensable requisites to becoming a freeman. The whole body of freemen in the town had the right to decide by vote whether any one should be admitted a member of their community, subject, however, to the revision of the Governor and his Assistants. A sufficient quantity of land was granted to the original association to provide liberally for three score families, according to the number and ability of each householder’s family. Under the direction of committees appointed by the Court the true bounds of every inhabitant’s land were laid out and ordered. In 1651, when the conditions on which the grant of the township was made had been complied with a deed of the plantation was executed by the Governor to Mr. FREEMAN, who then made conveyances to his associates. The town was incorporated as early as 1639, and the Indian name of Shawme was exchanged for that of Sandwich. In addition to these private “holdings,” certain meadows or marshy lands on the shore near the town were left for the grazing of cattle, as town’s commons, and controlled by the town as such. In time these became the property of the representatives of the original freemen. Other woodlands were at first free for every one to obtain from them timber and fuel for private use, but not for exportation. In what part of the township John Wing had his residence it is now perhaps impossible to determine. The old traditional home of one branch of the family for subsequent generations was situated about a mile from the present village of Sandwich, near a stream of water between two beautiful ponds, and on a highland overlooking the lower sheet of water and the town. This seems as likely as any other spot to have been selected as his residence. No more attractive location could be found in the town. Very probably the limits of the lower pond have been much increased inlater years by a dam thrown across its outlet, by which power has been gained for mills and other manufacturing establishments ; but even before this enlargement the scenery from that point must have been more than commonly fine. A number of farms are situated upon the neck of land between the two ponds (formerly known as “Wolf-trap Neck”), some of which have been in the possession of John’s descendants until the present time . The exact spot, however, which has generally been regarded as the original home of the progenitor is an eminence near the point where the stream from the upper pond falls into the lower, and since occupied as a factory for nails. Near the present building is an artificial cavity about fifteen feet square and several feet deep, which must once have been a cellar, and is even now surrounded by a few very ancient fruit and ornamental trees. The buildings which once were over and near it are gone, with every other relic of them, and the mansion which has been the residence of his descendants is situated about 200 rods westward. The farm which has usually been connected with this homestead consists of two or three hundred acres of valuable land up the stream and along the borders of the lower pond. Immediately before it across the sheet of water, which lies in the form of a semicricle about a mile in length, and within the arc of the semicircle, is an ancient cemetery, where the earlier inhabitants were buried On the outer and right margin of the lower end of the pond lies the main village, consisting principally of one street, along which are a grist mill, marble works, the town hall, an academy, several churches, a Masonic hall find two or three hotels. This part of the town has remained without essential alteration from the mosl ancient period of which we have any account. In 1638, almost immediately on the settlement of the town a church was formed, and there can be no doubt that public worship was maintained there from the very first. A rude building for that purpose must have been at once erected, for as early as in 1644 the one which was used for worship was calied “the old meeting house.” The ministers of that day in all the towns were invariably men of respectable talents and learning, such as everywhere commanded confidence and respect. There was something, however, in the disposition of the original inhabitants of Sandwich which was unfavorable to the harmony and growth of the original congregation The experience which some of them had had at Saugus was perhaps ill adapted to make-them cordial in its support. Even if the strict laws in relation to communion and ministerial subsistence and attendance upon public worship were observed, it is evident that a considerable degree of laxness was from the very first allowed. The freemen of the town were more than once censured by the General Court for allowing persons to settle and reside among them whose views were looked upon as disorderly. The stipends were poorly paid and often were reluctantly collected, the minister complained that few attended upon his ministrations and serious dissensions prevailed among the people. In one instance these are spoken of as caused by a party which had once been under the influence of Rev. Stephen BACHILER . The town authorities are said to have been unwilling, or from the state of public feeling unable to enforce the laws relating to public worship, and-.what were called irregularities. Some of the most respectable inhabitants, like Mr. Edward FREEMAN and Edward DILLINGHAM , among the original associates, were complained of before the Court and fined. An early record of the church shows only eleven male members, and neither in this nor in any subsequent notice of the business of the church does the name of John Wing nor any of his family for many years appear. They had probably all been communicants at Saugus, and they were doubtless decidedly religious people, but inclined to greater freedom in worship and in ecclesiastical affairs. We shall see that this spirit soon took a direction which led a large portion of the family to forsake the church and the forms of worship established by the civil authority. Very little can be learned from the meagre records of the town, the church or the general colony regarding the family history of John Wing. He appears to have been a plain man of ordinary intelligence, never aspiring to political distinction, and only ambitious to cultivate his land and decently to bring up his family. In a few instances, however, his name occurs on the records of the General Court as one well qualified for public business. In 1641 he is allowed six acres for his share of the meadow lands held at first in common, but divided afterwards annually for the use of the inhabitants in severally. On another occasion he was concerned in the construction of a road connecting Sandwich withthe earlier settlements. For some time the people had been obliged either to reduce their corn to meal by the slow and laborious Indian process by means of a mortar and pestle, or transport it all the way to Plymouth on their own shoulders or on the back of a horse or cow. Some apprehensions began early to be felt that the Indians of the West were hostilely inclined toward the settlers, and a law was enacted to prevent all Indians from having the use of firearms. A number of persons were complained of (about 1642) for allowing Indians to use such weapons even in hunting. Among these were the Assistant Governor Freeman and John Wing for lending guns to Indians. The date of John Wing’s or of his wife’s death is not recorded. The first part of the Book of Records of Sandwich either has been lost, or was originally so defective that very little can be made of them. The clerk of each town in the colony was by law required to keep a full register of all the births, marriages and deaths which occurred in his town, and these records form a valuable repository to which antiquarians and genealogists can now resort, but no public enactments could secure them against the negligence or the unskilfulness of the officials, the remissness of those who ought to have reported the facts or the ravages of fire in later times. Even the wills of many of the older settlers, from which much information might have been gained, are not unfrequently unrecorded in the county records. The Will of John Wing of the Town of Harwich in the County of Barestable was dated 13 April, 1696, at the beginning, but signed on May 2, 1696 and a codicil was added February 6, 1698/99. The will was probated August 10, 1699. “To “my Grand Son John WING IV my dwelling house out housings, orchards, yards, lands, meadows that is to say all the third part where I now live (beside Annanias and Josephs) both divided and undivided…only Reserving and my will is that if it so happen that my sd Grandson John Wing die not having an heir lawfully begotten…then all my sd house, lands, meadows and premised Shal be my Grand Son Elnathan Wings and his heirs and assigns. The witnesses were; John Thacher, John Dillingham, William Griffeth Jr. (by a mark) and William Parslow. This codicil was signed by a mark and witnessed by Jonathan Sparrow, William Parslow and John Dillingham. The inventory was taken at Harwich, May 8, 1699 by Kenelm Winslow, Sr. and Kenelm Winslow, Jr. The real estate was “the lands and meadows willed to Annanias Wing” valued at 80 pounds, the lands and meadows willed to John Wing at 100 pounds, and one parcel of meadow lying by the Swan Pond River, 9 pounds. “One Silver Cupp” was valued at 2 pounds, 6 shillings. “August the 5th, 1699, Serjant William Gray and Daniel Baker both of Yarmouth having praised a praced of meadow that was John Wings deceased that lyes on the easter side of the easter Swan Pond River, praised at nine pounds and they say…nine pounds is the full value of sd meadow. 8. JOHN, the second son of John and Deborah Batchelder Wing(l) of Sandwich, was born in England and came to America with his father in 1632. His age at that time is not known, and we have no means of learning it from any subsequent dates. He went with his father and brothers from Saugus to Sandwich on the first settlement of the latter town, but must have left home at an early period to form a new settlement on the Cape, eastward. The town of Yarmouth was incorporated in 1639, but in the last month of the same year Barnstable was set off between it and Sandwich. It extends from Barnstable Bay on the north to the sound on the south. A part of its northern shore was originally called Mattacheese from an Indian tribe residing there, on whose lands his maternal grandfather, Rev Stephen Batchelder, had, with a few friends, made a fruitless attempt to form a settlement. The precise date of his removal cannot be determined, as the early records of the town of Yarmouth were, in 1674, destroyed by fire and the first twenty pages of the Harwich records are entirely lost. The records ofthe “Monthly Meeting of Sandwich” show that the Society in that place was probably the earliest and for many years the largest of the same denomination in America. Regular worship has been maintained there since 1656, which was about 12 years after the rise of the sect in England, and before it had been generally established there. The township of Harwich was set off from Yarmouth in 1694; in 1703 that of Dennis from Yarmouth on the east; and in 1803 that of Brewster from Harwich on the north. Court and body of freemen incorporated by the government. There was some doubt whether Sautucket, the place at which John Wing had commenced building, was within the limits which had been given to Yarmouth township, and until that question had been decided it was deemed proper to prohibit its settlement. As, however it was reputed to be, and was soon afterwards proved to be within the chartered limits of the township, John Wing had already begun to build and soon established himself there. Indeed there are some indications that for an indefinite time before this he had purchased and lived upon a piece of land in the vicinity. It was in the northern part of the town, in the neighborhood of the sea coast. The Indians were then and for some time afterwards numerous in that region, but they were peaceable and never engaged in any hostile proceedings against the English. 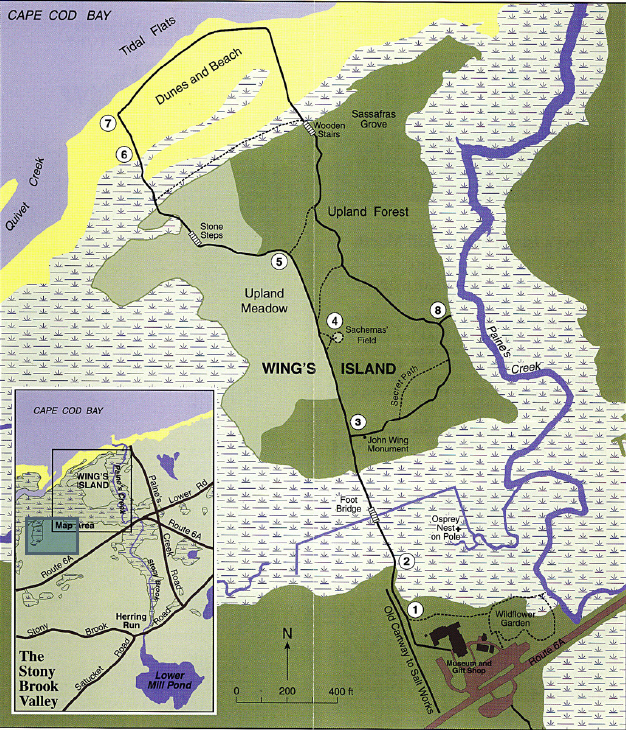 The precise spot on which John Wing settled is supposed to have been a high piece of land surrounded by swamp or meadow land, subsequently called “Wing’s Island,” about a mile northeast of the present town of Brewster. It was doubtless selected on account of its fertility and adaptation to the grazing of cattle. Freeman calls him and Lieut John Dillingham (also from Sandwich) “large land owners.” The line on the east of Brewster, for a long time called ‘Wing’s Line” was the base of future surveys, and indicates a tract of land extending across the peninsula from the northern to the southern coast. A large pond also in Brewster bears the name of Wing to the present time [1881, I don’t think it’s called Wing Pond anymore]. In 1677, at a town meeting May 30, “the townsmen of Yarmouth did forewarn John Wing and our neighbors of Sawfucket from purchasing any lands in the bounds of our township of any Indian, or to take any possession thereof from them as being contrary to Court order. The order here referred to was one which prohibited any pnvale purchases from the aboriginal possessors of the soil; in the first place because no private Indian was really the owner of tribal lands in severally, and in the second place because advantage was often taken of Indians by selfish and dishonest persons. It appears, however, that some transactions of this kind were allowed, especially with certain chiefs or sachems, who were actual owners of individual property. The very transaction here alluded to was subsequently allowed, and became the legal title to a large body of land. In the Book of Evidences of lands for the jurisdiction of New Plymouth there is recorded a deed of land, of which the following is the purport, viz: On the first of March 1676/77, John Wing and John Dillingham, in behalf of themselves and others’ associated with them, (viz: Thomas Clarke, Kenelm Winslow, Paul Sears and Ananias and Joseph Wing,) purchased of Robin (Indian), of Maltacheese, and Sarah his wife, daughter of Nepaitan, sachem of Mattacheese. of Samson, of Nobscusset, and Panasamust his wife, and of Ralph of Nobscusset, and Menetatomust his wife, other daughters of Nepaitan; all that tract of land, both upland and meadow, which they had in common or partnership lying in Saquetucket in the liberties of Yarmouth between the place commonly called Bound Brook on the west, and the middle of Saquetucket river on the east. Nepaitan was a chief under Massasoit, the principal sachem of the Wampanoags, a friendly tribe of Indians which had jurisdiction over all the Indians along the south shore of Massachusetts Bay He belonged to a tribe which went by the name of Mattaoheeaetts or Mattecheese. He with another chief of the same tribe with their heirs and assigns had been guaranteed the possession of a large parcel of land “bordering to the seawards between Bound Brook and the Sautnoket Elver;provided they should liveupon the same, and ifthey should ever sell the same, should sell it to the inhabitants of Barnstable before any other.” Freeman, Vol.I. pp.159-60. The names of Robin and Samson frequently appear in the Indian history of those times and always in acts of friendship toward the white settlers. See Drake’s Book of the Indians, Book 11. p.47. In this purchase John Wing was to have a third part of four shares, Dillingham two shares, Clarke one share, Winslow two shares, and Ananias and Joseph Wing each one third of four shares. The division was made and the land was deeded to each April 16, 1677/78. The original deed is said to be in the possession of Amos Otis, Esq., but a copy of it in full has been taken by the writer. The land lies within the limits of the present township of Brewster and is said to be among the most valuable in that vicinity. On the 15th of March, 1680, it appears from the town records that an agreement was made “with our neighbors, the purchasers or proprietors of the land between Stoney Brook and Bound Brook, subsequently signed by Ananias Wing, Paul Sears, Kenelm Winslow and John Dillingham, jun., on the one part, and by John Thacher and others on behalf of the town.” This was probably the final settlement of the question between the town and the association in the above mentioned purchase. No traces are now perceptible of the residence in which John Wing lived for more than forty years. His first wife’s name was Elizabeth, and Savage thinks that he found her in Saugus (Lynn). She was the mother of all his children She was probably the person meant in the record of Yarmouth, which says: “Jan. 31, 1692— The last of January Old Goody Wing died.” “In 1723 the pew No. 9 in the new meeting house was assigned to John Wing, Sen.,” for which he paid five pounds ten shillings, this being the ninth according to the dignity and valuation of the pews. For his second wife he married Miriam the daughter of Stephen Deane, of Plymouth, one of the “oldcomers.” (The “old comers” were certain of the colonists who came over in the three vessels which first arrived, viz. :the Mayflower, the Fortune and the Anne) John Wing died in 1699. His will was dated May 2d, 1696, and was witnessed by John Thatcher, John Dillingham and William Griffith. A codicil is dated Feb. 6, 1798-9. This will,which is very lengthy, was presented to probate Aug 10, 1699, and it is now on record at Barnstable. It makes mention of his wife Miriam, his three children, Ananias, Susannah Parslow, and Oseah Turner, his grandsons John and Elnathan and the children of his deceased son Joseph. He probably never bore office in his town, although he appears to have been public spirited and much respected. He was devoted rather to agriculture and the acquisition of land for himself and his children. His wife survived him for two or three years. She made a will,which was dated May 24, 1701, and was probated in January 1702/03. It gives the principal part of her property, inherited from her wealthy parents, to Deane Smith of Chatham whose mother was “her sister Bethia Smith of Monomoith.” The inventory of her personal property was taken in January, 1702/03, and its value was assessed at “seventy-eight pounds, twelve shillings and two pence. Joseph married April 12,1676, Jerusha Mayhew, and thus formed a connection with the celebrated missionary family of the Mayhews of Martha’s Vineyard. In the will of his father his sons are spoken of, but their names are not given. He was one of the shareholders in the land association which purchased the section between Privet Creek and Sauquatucket River. He was buried May 31, 1679. Ananias’ first wife Hannah Freeman was born 1666 in Harwich, Barnstable, Mass. Sources do not give Hannah’s parents, which is surprising because there was only one Freeman clan living in Cape Cod at the time. Hannah died 9 Dec 1730 in Harwich, Barnstable, Mass., the same date of Hannah Tilton’s death. I’m beginning to think there was no Hannah Freeman. We do know that Ananias married a girl named Hannah from Tisbury … and Samuel Tilton mentions his daughter Hannah Wing in his will. We also must bear in mind that around this time we only had one Nathaniel Wing and certainly one Ananias Wing. 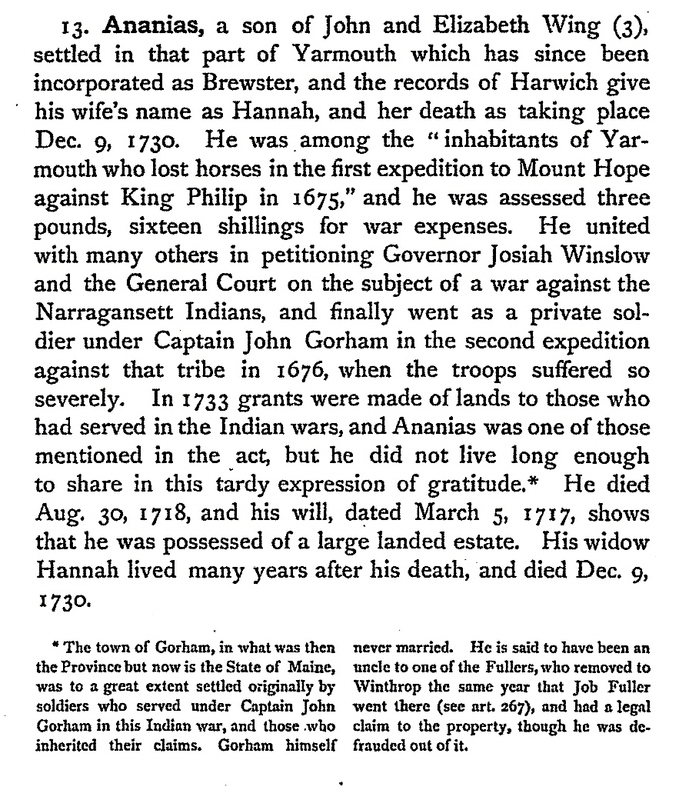 Walter Goodwin Davis, the family historian for the Tilton family, states that the will of Samuel Tilton of Chilmark, Martha’s Vineyard which was made on Jun 5, 1718 names a daughter Hannah Wing. Davis mistakenly thought that Hannah Tilton married Nathaniel Wing, but the only Nathaniel Wing around at that time was the son of Stephen Wing and he would marry Sarah Hatch around 1687. Samuel Tilton came to the Vineyard with Isaac Chase, a Quaker, and was related to him by marriage, and Parson Homes, in his diary states that he was “against swearing”, i. e. in taking the legal oath in the name of Deity, it is a strong inference that he was a Quaker, or in accord with their beliefs. Ananias settled in that part of Yarmouth which has since been incorporated as Brewster. He was among the “inhabitants of Yarmouth who lost horses in the first expedition to Mount Hope under Capt. John GORHAM against King Philip in 1675,” and he was assessed £3 16 00. He united with many others in petitioning Governor Josiah Winslow and the General Court on the subject of a war against the Narragansett Indians, and finally went as a private soldier under Captain John GORHAM in the second expedition against that tribe in 1676 when the troops suffered so severely. In 1733 grants were made of lands to those who had served in the Indian wars, and Ananias was one of the few who survived to share in this tardy expression of gratitude. He died Aug. 30, 1718, and his will dated March 5, 1717, shows that he was possessed of a large landed estate. His widow Hannah lived many years after his death and died Dec. 9, 1730.
i. Deborah Wing b. 2 May 1687 in Harwich, Barnstable, Mass. ; d. 9 Feb 1726 Harwich, Barnstable, Mass; m. 15 Oct 1714 in Harwich, Barnstable, Mass to George Weeks (b. 20 Mar 1689 in Dorchester, Suffolk, Mass. – d. 10 Apr 1772 in Harwich, Barnstable, Mass), His parents were Ammiel Weeks and Abigail Prescott. iii. Elnathan Wing b. 20 Oct 1692 in Harwich, Barnstable, Mass; d. 14 May 1772 Falmouth, Barnstable, Mass; m. 7 Oct 1726 in Chilmark, Dukes, Mass to Hannah Allen (b. 1707 in Chilmark, Dukes, Mass. – d. 22 Sep 1763 in Harwich, Barnstable, Mass.) Her parents were Samuel Allen and Mary Tilton. iv. Samuel Wing b. Aug 1694 in Harwich, Barnstable, Mass. ; d. 11 Apr 1774 Harwich, Barnstable, Mass; m. 3 May 1733 in Harwich, Barnstable, Mass to his first cousin once removed [I think that’s it] Mercy Wing (b. 25 Dec 1713 in Harwich, Barnstable, Mass – d. 1758 in Harwich, Barnstable, Mass.) Her parents were John Wing and Bethia Winslow. Her grandparents were John WING (III) and Mary DILLINGHAM and her great grandparents were John WING(E) (II) and Elizabeth DILLINGHAM. vi. Elizabeth Wing b. Feb 1700 in Harwich, Barnstable, Mass. ; d. 4 Jul 1783 Dennis, Barnstable, Mass; m. 24 Oct 1723 in Harwich, Barnstable, Mass to Ralph Chapman (b. 19 Jan 1695 in Barnstable, Barnstable, Mass – d. 8 Feb 1779 in Dennis, Barnstable, Mass) His parents were Isaac Chapman and Rebecca Leonard. vii. John Wing b. 3 Apr 1702 in Harwich, Barnstable, Mass. ; d. 1773 Harwich, Barnstable, Mass; m. 21 Feb 1728 in Eastham, Barnstable, Mass to Mary Knowles (b. Oct 1709 in Eastham, Barnstable, Mass. – d. : 8 Apr 1773 in Mass.) Her parents were John Knowles and Mary Sears. viii. Mary Wing b. 18 May 1704 in Harwich, Barnstable, Mass. ; d. 1741 Harwich, Barnstable, Mass; m. 16 Nov 1734 in Harwich, Barnstable, Mass to John Rogers (b. 1 Aug 1701 in Harwich, Barnstable, Mass – d. 29 Aug 1739 in Harwich, Barnstable, Mass.) His parents were John Rogers and Priscilla Hamblin. ix. Joseph Wing b. 17 Sep 1707 in Harwich, Barnstable, Mass. ; d. 24 May 1749 Brewter, Barnstable, Mass; m. 17 Feb 1737 in Harwich, Barnstable, Mass to Susanna Kendrick (b. 21 Jan 1714 in Harwich, Barnstable, Mass.) Her parents were Edward Kendrick and Deborah Tucker. Susannah’s husband William Parslow was born 1646 in Harwich, Barnstable, Mass. William died in 1721 in Harwich, Barnstable, Mass. This entry was posted in 11th Generation, Dissenter, Immigrant - England, Line - Shaw, Pioneer, Place Names and tagged Harwich, Harwich Pioneer, Ten Men from Saugus 1637, William & Francis 1632. Bookmark the permalink.